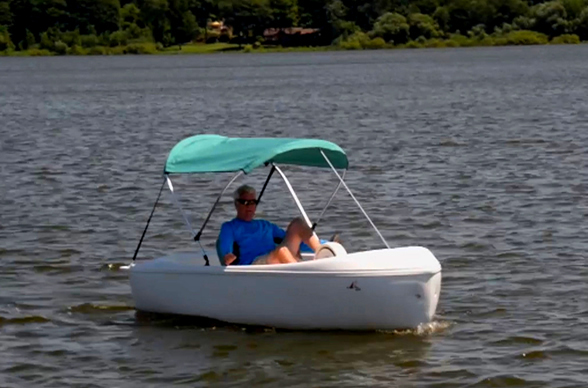 Finally a pedal boat experience for two with features not found in our other models. Much more versatile with the kick-up rudder and removable drop-in drive units, making it easier to beach and use in shallow water. Going alone? Drop in a drive unit in the center, re-position the seat and off you go! You are the power behind this boat! Its “all in one” drive system is unlike other drive systems in the Nauticraft line. No drive shaft needed, the propeller is attached to the drive unit itself for ease in removal and use. The rubber belt is easy to replace and more cost conscious than other designs. View our How To Maintain videos for the Sprite. 4.7 out of 5 based on 7 user ratings.